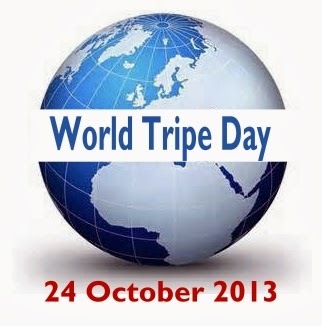 The Tripe Marketing Board will be spending the next two weeks preparing for the inauguration of World Tripe Day on 24 October 2013. The annual celebration of tripe will be launched at a high-profile event in the House of Commons involving sports celebrities, politicians, opera singers, chefs, radio celebrities and cartoonists who have all expressed an interest in tripe. TMB Chairman Sir Norman Wrassle, speaking on his return from Bergerac where he was the guest of Tripiers De France, said: "We are sad that not everyone will be able to join us in London, but we hope nonetheless that there will be celebrations up and down the land whether that be in restaurants, butchers' or bookshops, so there should be plenty of opportunity for tripe lovers to join in." Lighten up your life with a humorous book from the TMB! A New Day About To Dawn For Tripe! The Tripe Marketing Board, a division of LEB Ltd. Copyright LEB Ltd 2012/2017. Simple theme. Powered by Blogger.